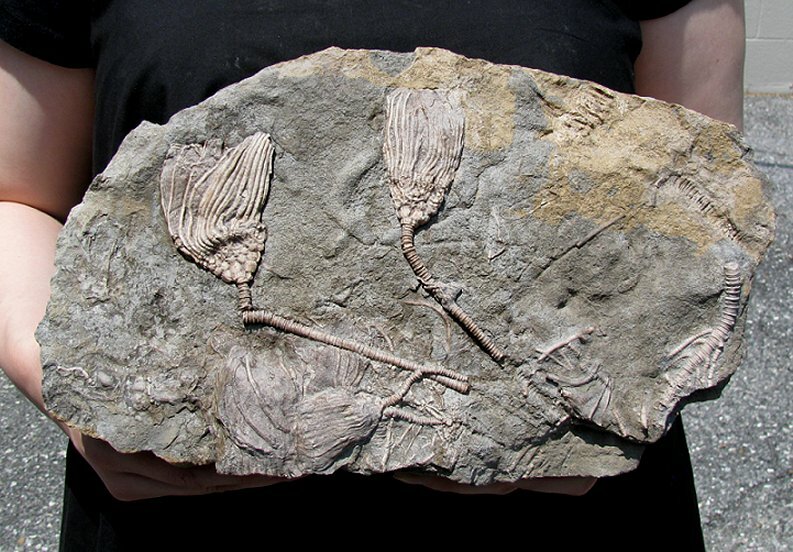 Here is an amazing crinoid plate from a location that is now closed to collecting. This is killer Cactocrinus imperator multiple slab from the Mississippian of Gilmore City, Iowa. This specimen was intrenched in a collection for over 30 years and was acquired directly from the collector who found the piece. There are three beautiful crowns and many stems and partial crinoids preserved on the plate. 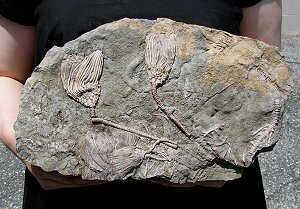 The fossil ''sea lilies'' are very 3-dimensional and exhibit wonderful detail. The striking camerate crinoids have a large, stellate-plated cup and long, stout biserial arms that display fine pinnulation. The gorgeous, white-brown crinoids contrast beautifully with the grey matrix plate. The extinct echinoderms still have their LONG stems intact and display beautifully on the large, natural slab of limestone. This is an extremely collectible multiple example of large Cactocrinus crinoids from the Gilmore City "Cacto" layer that has not been exposed for over 30 years!